This hotel is 100PCT Non-Smoking. 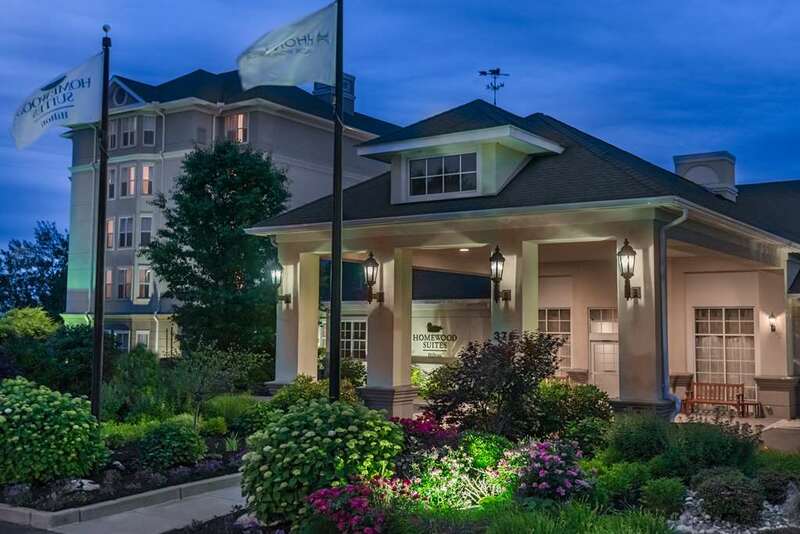 The Homewood Suites by Hilton Holyoke-Springfield/North hotel is located just north of Springfield Massachusetts off of I-91 with easy access to the Massachusetts Turnpike. This all-suite hotel can accommodate a variety of travelers* needs whether relocating to the Holyoke-Springfield area or just visiting for a family vacation. The Homewood Suites by Hilton Holyoke-Springfield/North hotel is located just 30 minutes from the Bradley International Airport. Take advantage of our location to Holyoke-Springfield area local attractions including Holyoke Mall at Ingleside /within walking distance/ Six Flags New England /discounted tickets available for purchase/ Basketball Hall of Fame /discounted tickets available for purchase/ Volleyball Hall of Fame Yankee Candle Flagship Store /South Deerfield Massachusetts/ Holyoke Children*s Museum Start each morning with our complimentary Suite Start hot breakfast featuring a deluxe selection of your favorite breakfast items. Monday through Thursday we invite our guests to wind down at our Welcome Home Reception featuring light dinner fare and beverages. Amenities at the Homewood Suites by Hilton Holyoke-Springfield/North hotel include Complimentary high-speed Internet access in every suite Wireless Internet connection in all common areas of the hotel Fitness center Indoor pool - whirlpool Suite Shop Guest Laundry 24-hour business center Hilton HHonors Points - Miles are awarded for all qualifying stays. We stand behind our service and quality so much that it*s all backed by our Suite Assurance Guarantee. We are confident that you will enjoy your stay with us. If you are traveling for business or leisure it will be our pleasure to serve you with the most efficient and friendly service at the Homewood Suites by Hilton Holyoke-Springfield/North hotel in Massachusetts. Make Yourself At Home. 99 Restaurant - Pub: Casual classic American dining experience. This restaurant has an extensive menu and great service. While it offers a great dining experience it is also a great place to sit at the bar and enjoy a cocktail. The Delaney House: The new Delaney House Bistro features an elegant bar boasts an oyster - shrimp display and its own show kitchen. It*s a great place to meet friends and family savor a signature Delaney House Cocktail and enjoy the tasty fare.